The Stannah 320 Outdoor gives you access to the world outside the walls of your house. 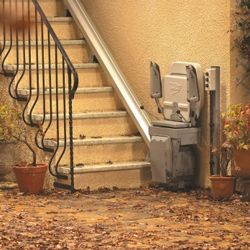 Installed far more quickly and taking up a lot less room than a ramp, this stairlift can also be used to bring your groceries and other items upstairs. Designed for hot and cold climates, it has proven its abilities everywhere from New England to Hawaii. The 320 Outdoor also comes with a protective cover and can be locked by key for extra security. Please visit the Stannah Website for more information on the Stannah Stair Lifts.